Share "Your Guide to Catering a Large Backyard Party"
There’s nothing better than being out in the yard enjoying the sun while having fun with friends and family. As it gets warmer, it’s time to start thinking about hosting the perfect backyard party. Parties can be either simple or difficult to throw depending on how much preparation and planning you put into it. What stumbles most people is their budget and the belief that they have to own or already be in possession of everything they need to cater a large backyard party. The answer to this problem is utilizing a rental dealer to help provide everything you need. In this article, you will find a simple guide to accommodating a large backyard party. It simply doesn’t make sense for you to own enough chairs, tables, and other tools to host a large party. The ownership method is expensive and difficult to accommodate. The first step to catering a large party outdoors is renting a tent. Tents come in all shapes and sizes and are often the first items to go during this season. Everyone is looking for a big tent this time of year for graduations, weddings, and reunions. Don’t sleep on contacting your rental dealer for a tent that’s big enough for your guests to relax out of the sun. The second step is to rent tables and chairs. An event is not fully catered unless it comes equipped with table and chairs for guest to sit, eat, and enjoy their time. One of the great positives of working with a rental dealer is the number of options and styles that are available to choose from. Rentals offer you the flexibility to try something new and give your guests a quality experience that matches any occasion. Feel free to mix and match to find an arrangement that best meets your budget and plan for the party. 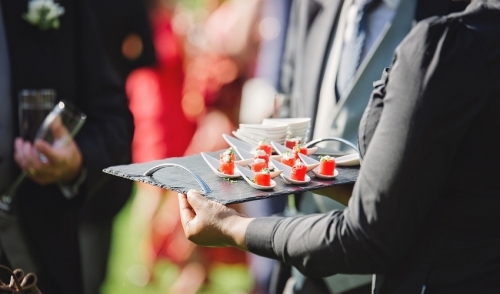 The next step in the guide is to rent all the catering tools to prepare, setup, and provide food and beverages. Items such as chafers, large propane grills, bars, and extra coolers can all be rented to help provide your guests with hot food and cold drinks at your party. Lastly, rent entertainment for both adults and children. Moonwalks or bounce houses and games like corn hole or horseshoe are great ways to keep everyone engaged and active throughout the party. You can even take it one step further by nabbing a karaoke machine to really increase the fun. If you have pool in your backyard, kick things up a notch by renting a slip and slide for everyone to slide into summer with a smile. Take advantage of the tips described above to successfully cater a large backyard party. Make it easy on yourself, reduce the stress and rent everything you need. Follow this guide and start entertaining guests without any hassle and instead, all the fun. © 2019 Belgrade Ace Hardware. All rights reserved.